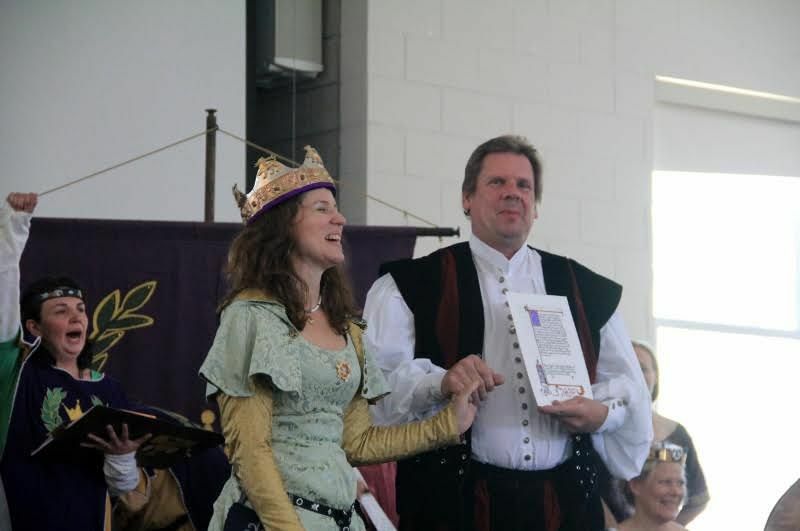 Their Royal Majesties King Omega V and Queen Etheldreda IV held Court at Iron Bog Baronial Investiture and King and Queen Rattan Championship, in the Barony of Iron Bog, on June 13. The Gazette thanks Reporting Herald Baron Ernst Nuss von Kitzingen, and additional Court Heralds Lady Maria von Ossenheim, Master Ryan McWhyte, Master Malcolm Bowman, Lady Elena de los Libros, and Master Rowen Cloteworhty, for providing the following list of business conducted. During the morning court, Baron Collin Monro of Tadcaster and Baroness Marion del Okes said their farewells before retiring to their estates. A thank you scroll for Baroness Marion, scroll by Elisabeth Greenleaf, was presented. A Court Barony with Grant of Arms was presented to Baron Collin, in the form of a stained glass award made by Conor O Ceallaigh. However, their Majesties were not yet done with Collin, as he was then presented with a Writ for Pelican, scroll by Brangwyne of Wentworth. 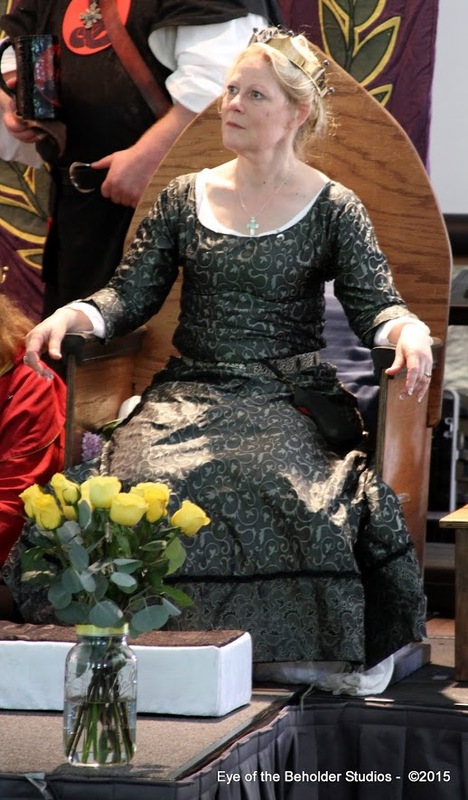 With much joy, Lady Creatura Christi of Oakes was invested as Baroness Iron Bog. A scroll by Rhonwen Glyn Conwy was presented to Baroness Creatura. A Writ for Pelican was presented to Gisela Szabo. Duchess Sedalia MacNare was presented with both the Queen’s Award of Excellence as well as the King’s Award of Excellence. Amy Webbe was inducted into the King’s Order of Excellence, scroll by Nest verch Tangwistel. Elena de los Libros was received her Award of Arms (scroll illumination by Svea the Short-sighted, calligraphy by Faolán an Sccreccain and wording by Nest verch Tangwistel) and was made the East Kingdom Emissary to Trimaris (scroll illumination by Svea the Short-sighted, calligraphy by Faolán an Sccreccain and wording by Ernst Nuss von Kitzingen).